Is April Fools' Day Worth the Risk for Brands? Three hundred sixty-four days a year, brands work hard creating content to build and strengthen trust with their audiences. But on a single day in April, many brands suspend those trust-building efforts and throw them out the window by publishing content deliberately meant to fool (or worse, make fools of) their audiences. 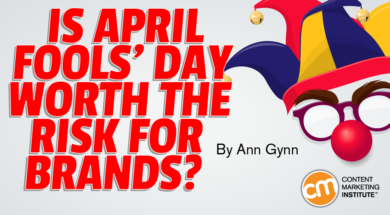 If your brand has never used humor or the element of surprise in its content, April 1 is not the time to start. 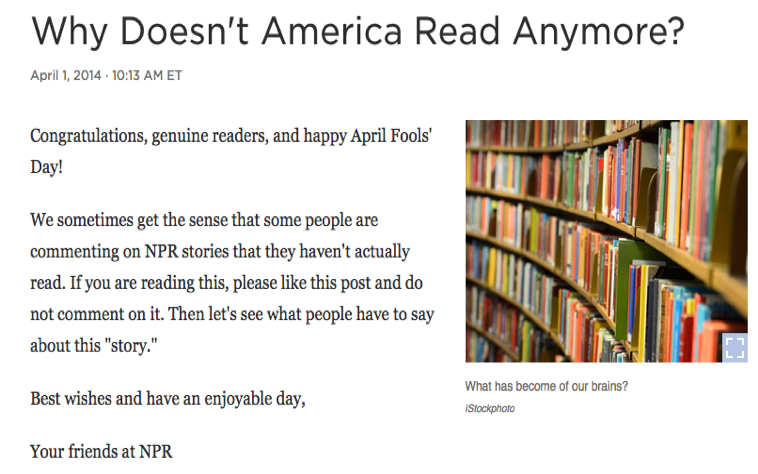 If your brand thinks of April Fools’ as a one-day joke, don’t do it. If your brand isn’t prepared to devote significant resources to develop a thoughtful, well-executed campaign, don’t do it. If your brand leaders can’t weather criticism, don’t do it. If, after all those caveats, you think April Fools’ fits with your brand, read on for some inspiration. And if you recognize April 1 isn’t a day for your brand to celebrate, read on for some universal lessons to use all 365 days of the year. Burger King frequently uses humor in its content. “BK is hilarious on Twitter,” writes Lindsay Welgarz in The Most Genius Tweets from Burger King’s Twitter Account. That approach to humor perhaps is why April 1 is permanently circled on its creative calendar. The brand historically launched “new” products on the day, including the Left-Handed Whopper (redesigned by moving condiments 180 degrees) and the Chocolate Whopper. “April Fools’ has become a major date for Burger King and our campaigns have generated massive engagement with a younger, and often harder to reach, audience,” said Fernando Machado, Burger King global chief marketing officer, in the recent announcement. While we don’t yet know what’s in store for this year’s prank, next year’s April 1 celebration may come from a student. Given that Burger King’s April 1 product releases attract a young audience, the brand strengthened that audience connection by partnering with the Clio Awards for the King’s Fools’ Challenge. The winner of the Clio’s 2019 Student Integrated Campaign category will become an honorary creative director at Burger King and will be tasked with bringing its caper for 2020 to life. “We thought this would be a great way to challenge up-and-coming creatives to show us how they would cut through the noise and hijack popular culture with the ultimate prank,” Fernando said. If humor is appropriate one day a year, it should be part of your brand voice throughout the year. Think about how you can use a seemingly one-time encounter as a kickoff to a long-term relationship with your new audience. While Burger King uses April 1 to launch “new” products, Rent the Runway used the day to launch a “new” service, which Patrick Burke, chief marketing officer at Grapevine, shared with us. As he explains, more than 54 sites, including the Associated Press, The Washington Post, BuzzFeed, and Time picked up the Rent the Runway for Dogs news in 2018. 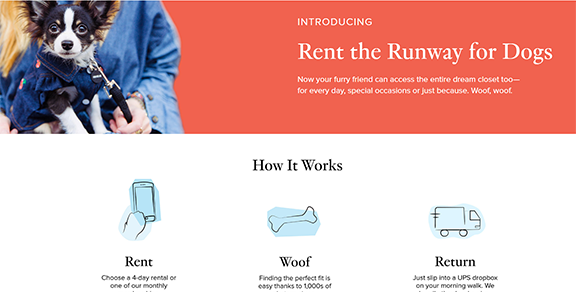 And the prank continues today as the landing page remains – and you can still sign up to express interest in renting dog clothes. Use your content to garner media attention. If your content is fresh, unique, and valuable, media and other sites are more likely to talk about it. Use April 1 as a time to test audience response to products or service that seem outlandish. Use a separate landing page for your content – don’t mix fact and fiction on the same page. PR expert Karen Jayne Blattenbauer reminds us of a foolish Google fail from a few years ago. On April 1, 2016, Google added a new feature to Gmail – an orange button next to the standard “send” button. A click on that orange button led to the delivery of the email with a GIF of a little yellow Minion character dropping a microphone. And the fun didn’t stop there. The mic drop ended the conversation, preventing the sender from seeing subsequent replies. Don’t develop a promotion that disrupts your audience’s use of your products or services. Vet your idea with multiple stakeholders. A creative team member may think an idea is great, while the customer may not. Talk to people in non-creative departments to see what they think. Make the content relevant and satisfy the audience’s curiosity quickly. Invite your audience inside your humorous content efforts and enlist their help in spreading the fun on social media. How will competitors react? Are they a hungry dog just waiting for you to hold out a juicy bone in the form of self-mockery? The media? You’ll most likely get some sort of a pass since it is April Fool’s Day after all, but don’t assume you’ll get a get-out-of-jail-free card – especially if you’re a publicly traded company and you joke about solvency. Employees? If you’ve been light on raises in the last couple of years, best not to drop a ton of money on a slick April Fool’s ad unless you can prove it’s good for your bottom line. Is your brand celebrating April Fools’ Day? Have you seen some wins and fails today? Please share in the comments. Have fun without any pranks at Content Marketing World this September. Register today using code BLOG100 to save $100.